Perfect for those who love nautical decor or build it for a child who loves pirates. 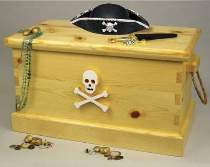 This chest features a secret lock - you turn the skull and a hidden hook releases the lid. Chest has a double floor which creates a secret compartment for hiding valuables. Corners feature authentic box joint construction. Project is made from 3/4" lumber and 1/4" plywood. Order #4059 Pirate Chest Hardware separately, or save on the #5057 Pirate Chest Special! The #5059 Pirate Chest Hardware includes a pair of wrap-around hinges, screw eye, screw hook, rope and lid support. The #5057 Pirate Chest Special includes #W3539 Pirate Chest Plan as well as the #4059 Pirate Chest Hardware. Project plan, wood and wood finish are not included.